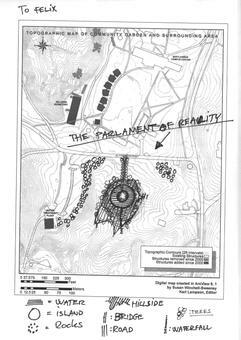 The parliament of reality nestles gently within the green campus of Bard College in Annandale-on-Hudson, New York. 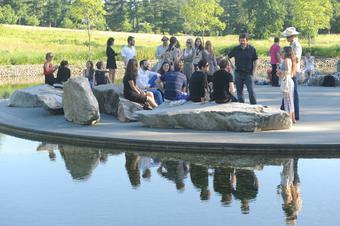 A ring of trees circumscribes a gathering place on a round island at the centre of an artificial pond. 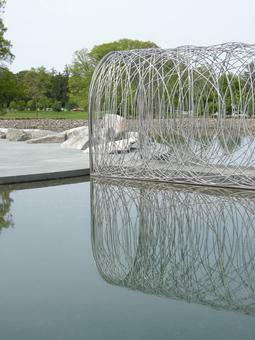 In spring, summer, and autumn, the twenty-four Golden Chain trees (Laburnum anagyroides) screen the artwork off from the surroundings, creating a discrete natural space for meeting. 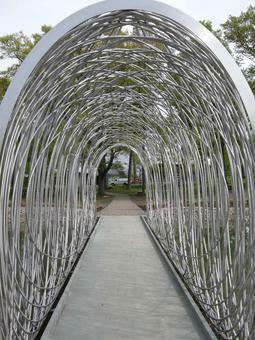 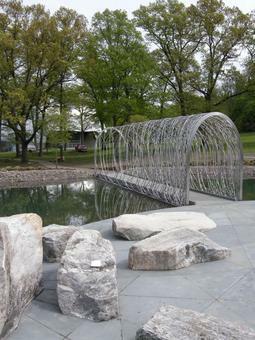 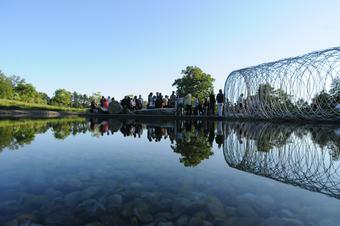 A bridge covered by an arched tunnel of stainless-steel tracery leads to the island. 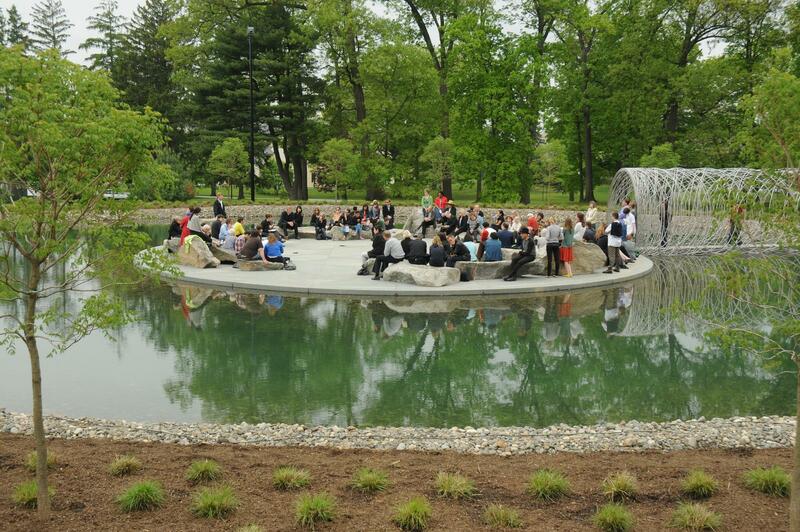 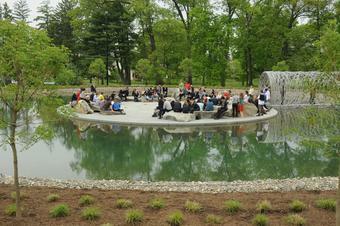 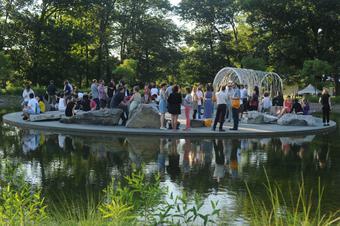 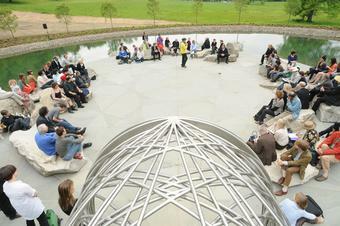 Boulders arranged around the periphery of the island invite users – students, teachers, and visitors – to sit down, relax, and discuss. 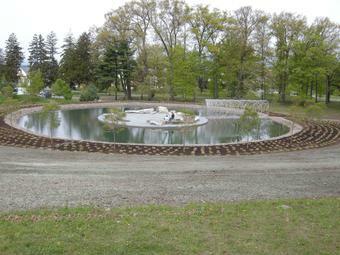 Individually cut stone tiles on the floor map out a pattern of criss-crossing lines that converge clock-like at twelve points along the island’s circumference. 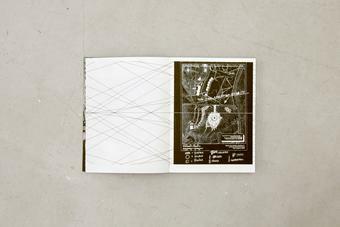 The pattern, inspired by the twelve-point wind rose of antiquity and by the intersecting lines of nautical charts, gestures towards the navigation of ideas that is the central activity of a parliament.